This book has become a standard text in seminary and university classrooms. The purpose of this second edition is to help readers come to a critically informed understanding of the Old Testament as the church's scripture. This book introduces the Old Testament both as a witness of ancient Israel and as a witness to the church and synagogue through the generations of those who have passed these texts on as scripture. The authors of this volume share a commitment to the interpretation of the Old Testament as a central resource for the life of the church today. At the same time, they introduce the Old Testament witness in a manner that honors the importance of biblical scholarship in helping students engage the variety of theological voices within the Old Testament. This second edition gives special attention to deepening and broadening theological interpretations by including, for example, issues related to gender, race, and class. It also includes more detailed maps and charts for student use. 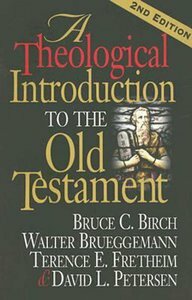 About "A Theological Introduction to the Old Testament (2nd Edition)"
Bruce C. Birch is Dean and Woodrow W. and Mildred B. Miller Professor of Biblical Theology at Wesley Theological Seminary in Washington, D.C. He is a contributing author to volume II of the "New Interpreter's Bible" and "The Old Testament: A Theological Introduction". Terence E. Fretheim (Ph.D., Princeton Seminary) is Elva B. Lovell Professor of Old Testament at Luther Seminary, St. Paul, MN. He is interested in biblical-theological issues and their implications for the faith and life of the church. He is author of numerous articles and books, including The Suffering of God: An Old Testament Perspective, and commentaries on Genesis (New Interpreter's Bible Commentary), Exodus (Interpretation), Jeremiah: A Commentary (Smyth & Helwys) and Abraham: Journeys of Family and Faith (University of South Carolina Press). David L. Petersen (Ph.D., Yale University) is Professor of Old Testament at Candler School of Theology, Emory University, Atlanta, GA. Professor Petersen is a distinguished Old Testament scholar whose current research focuses on the book of Genesis and on prophetic literature. Petersen recently served as president of the Society of Biblical Literature. His significant books include Haggai and Zechariah 1-8 (Old Testament Library, 1984); Zechariah 9-14 and Malachi (Old Testament Library, 1995) and A Theological Introduction to the Old Testament (2005) .